Home Articles Weight management Does my obesity say something about my spouse and vice versa? Does my obesity say something about my spouse and vice versa? How much does the people we live with influence our eating habits and healthy living? We’ve seen in the past that the Body Mass Index and obesity are positively related in couples. That is true especially for couples who have lived together for a long time. Below we describe this phenomenon a bit more closely. What happens to the BMI? It looks like when our spouse’s BMI changes so does our own. In a recent study, an increase in the BMI of the spouse by 1 led to a 0.1 increase in men’s and 0.15 in women’s BMI. Spouses where both members shared an unhealthy diet demonstrated a greater association in BMI changes. That was not true for the ones who either shared a healthy diet or exhibited non harmonious behaviours in terms of diet or healthy living. The fact that spouses tend to have similar BMIs highlights that over time they develop common habits through living together. Predominantly they develop similar eating habits. However this is not always the case. One example of diverging behaviours is smoking. In that same study, for couples where one but not the other was a smoker at baseline, it was observed that changes in the BMI were not analogous. More importantly when couples’ behaviours diverged on smoking they usually diverged on other behavioural indicators as well. 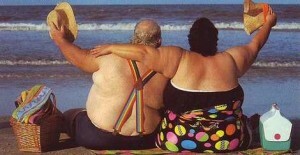 Obese participants were more likely to have obese spouses. Both at baseline and over time. A man who was not obese when the study was initiated, and his spouse was not either, but became obese during the time of the study, was 78% more likely to become obese himself relative to what would have happened if his wife remained non obese. This was one of three incidents observed. The other two are one a non-obese man whose wife goes from obese to non-obese and two a non-obese man whose wife stays obese throughout the study. In both those incidents spousal obesity was not found to be significantly associated to individual obesity (the man’s). Non-obese women whose spouse was non-obese at baseline but became obese during the study were 89% more likely to become obese. It seems that couples who differ in terms of their obesity status are less likely to be following similar health behaviours, but more importantly it looks as though they are unlikely to influence each other’s behaviours and eating habits over time. On the contrary couples who have the same, or pretty much the same, obesity status appear to affect each other’s behaviour more. We should take an interest in our spouse’s diet and obesity if for no other reason because it also affects our physical condition as we saw above. Cobb L.K., McAdams-DeMarco M.A., Gudzune K.A. et al. (2015) Changes in Body Mass index and obesity risk in married couples over 25 years, The ARIC cohort study, Am J Epid, Epub ahead of print.